The following are short descriptions of the circle shown below. Tangent - is a line that would pass through one point on the circle. 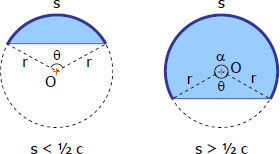 Secant - is a line that would pass through two points on the circle. 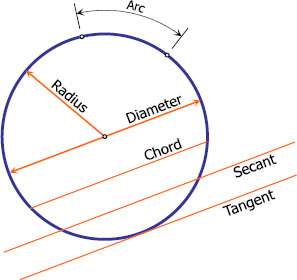 Chord - is a secant that would terminate on the circle itself. Diameter, d - is a chord that passes through the center of the circle. Radius, r - is one-half of the diameter.